If you haven’t had Hong Kong style waffles, you’re missing out. Served on the Hong Kong streets, these yummy treats are great for snacks, dessert, and breakfast. Different from your standard or Belgium waffles, these are thin, bubbly, hexagonal egg waffles. 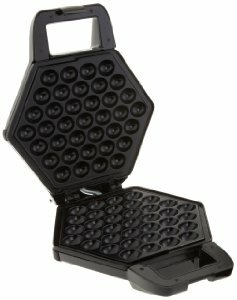 With the CucinaPro Bubble Waffler, you can easily enjoy these treats at home. Don’t worry, it comes with the recipe for these delicious waffles.